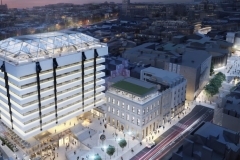 Refurbishment and fitout of the historic Central Bank HQ site. Designed and built in the 1970s, the building’s iconic exterior will remain largely preserved with the addition of a new, grand staircase entrance and an enhanced, open plaza space for the public to enjoy. Works include the upgrading and refurbishments of the main tower’s existing office floors over 7 storeys, which are to be fitted out with elegant and high-end finishes. 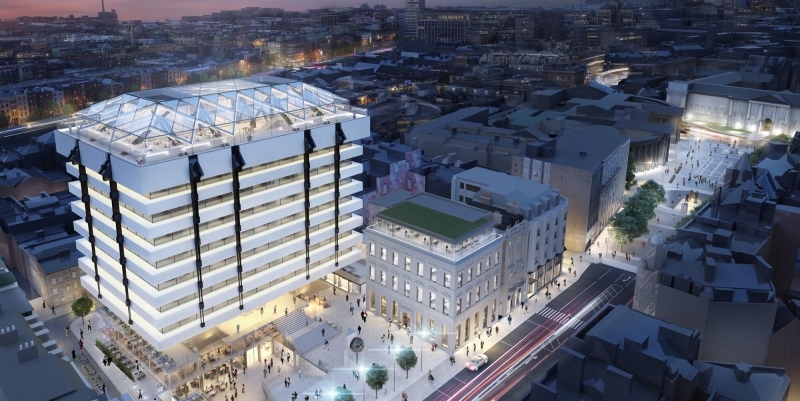 Additionally, the top-most level of the Central Plaza Tower will be a two-storey, glass-roofed structure which will house a restaurant, hospitality, and viewing areas where visitors will have breath-taking views of Dublin’s city scape. This is the second project Stewart Construction has undertaken in conjunction with Hines, a major player in global real estate investment.